Carl Linnaeus was born on the 23rd of May, 1707 at Råshult, in the parish of Stenbrohult, where his father was vicar, in Småland, Sweden. Young Carl Linnaeus loved to spend his days out in the countryside, which in pre-industrial Sweden was rife with fresh air and wildlife. He avoided the schoolroom to such a degree that his father despaired he would ever amount to anything. However, the local doctor, Johan Rothman, saw more in the boy's interest in nature, and encouraged him to study medicine, which then included botany. Linnaeus attended the University of Lund, where he studied medicine for a year before moving on to the larger University at Uppsala. Like so many students, past and present, he lived in poverty while pursuing his education, and like so many, he persevered and became an outstanding student. Soon Doctor Olaf Doctor Celsius, botanist and priest, happened upon young Linnaeus in the University's botanical garden, and was taken with his knowledge and interest in plants. Soon Dr. Celsius offered Linnaeus lodging, and mentored him in his studies. In return, Linnaeus tutored the professor's son, and soon realised one of his greatest talents, that of teaching. The University also recognised Linnaeus' talent for teaching and promoted him to the position of Assistant to the Professor of Botany, an assignment with many responsibilities and an almost non-existent income. Before he completed his degree, the Academy of Science elected him to go on an exploration of Lapland and record any new plants he found there. So on Friday, the 12th of May, 1732 he set out alone from Uppsala and trekked hundreds of miles through northern forests and across the tundra, mapping the land and seeking new plants. Although the term 'ethnobotany' was not coined until 1895 by John W. Harshberger, Professor Paul Alan Cox, former Director of the National Botanic Gardens in Hawaii and Florida, has proposed that Linnaeus was the first to practice this relatively new science. On his first expedition Linnaeus not only took detailed notes of the plants he found, but also of the indigenous people he met, and the way in which they used the plants for food and medicine. He travelled light and lived with the people he met, ate the same food, and even adopted their clothing, much as many modern ethnobotanists do. He returned with over one hundred dried and pressed specimens that were new to science. He so liked his Saami clothes from Lapland, complete with talismans and Shaman's drum, that he had the artist Hoffman paint his portrait. In fact, most portraits from Linnaeus's youth picture him in his favourite garb, and it is likely that he used these clothes for his many plant hunting expeditions, having learned early that the foppish attire of the period was both a hindrance and a hazard in the wilds. In this portrait he holds a sprig of Linnaea borealis in his right hand, a flower he admired so much he asked a friend to name it after him. He felt it would be immodest to name it himself. The Twin-flower, as it is commonly known in English, is remarkable in that it is pan-arctic, growing in the northern regions of Asia, North America and Europe. It was during this time that he began to develop his system of classification, as the existing methods were proving inadequate for naming all the new species recorded each year. 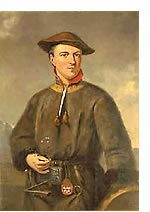 On one of his many expeditions, Linnaeus visited Dalarna and the copper mine in the town of Falun. Here he met Sara Elisabeth, the daughter of the local doctor Johan Moraeus and proposed to her a fortnight later. In his youth Moraeus had taken his MD in Holland and now he insisted that his future son-in-law should do the same. So, in 1735 Linnaeus went to the University of Harderwijk in the Netherlands, where he finished his medical degree, published his first treatise on classification, Systema Naturae, and then enrolled at the University of Leiden for further studies. For three years Linnaeus remained in the Netherlands, where he corresponded and met with many or Europe's greatest botanists and continued to refine his system of classification. During this time he became the curator of a private botanical garden, Hartecamp, just outside Harlem. He visited the garden's wealthy owner in England in 1736, and met many of Europe's great thinkers. In 1738 he returned to Sweden to practice medicine and lecture on a variety of subjects and continue his own studies. Soon after his return he married the young woman he had proposed to three years earlier. According to one biography, 'She turned almost overnight into a dragon' and that 'He was to regard her with respect and terror for the rest of his life'. Nonetheless he had five children with her, four daughters and one son, Carl von Linné Jr. In 1741 he was awarded a professorship at Uppsala University, where he once again embraced his natural vocation of teaching. He also oversaw the restoration of the university's botanical garden, where he quite naturally organised the plants by his own system of classification. His popularity as a teacher at the university was unprecedented, with student ranks eventually swelling from five hundred to fifteen hundred undergraduate students during his tenure. Many of Linnaeus' students went on to travel the world, seeking out new plants and returning their discoveries to their former professor for inclusion in his ever increasing classification lists. Linnaeus also corresponded with students of botany throughout Europe and beyond, one of whom was a young Joseph Banks. One of Linnaeus's star pupils, Daniel Solander, would later join Banks in one of the greatest botanical expeditions in history. Although Linnaeus continued to practice medicine, eventually being appointed physician to the Swedish royal family, his teaching and plant studies remained the focus of his life. He was ennobled in 1757, and given the suitably grand sounding name of Carl von Linné. He died of a massive stroke in January of 1778. During his life, Linnaeus had published over 170 scientific works and had influenced the world of botany for centuries to come. Erasmus Darwin, grandfather of Charles Darwin, translated many of Linnaeus's published works into english, making them accesible to many more people. The Linnaen Society of London is has a superb site with details from Linnaeus's life and his ongoing legacy.